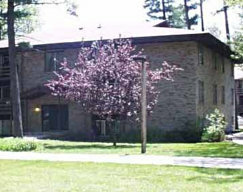 NMC has 2-bedroom and 1-bedroom on-campus apartments that are ideal for students 21 years of age and older. All apartments are non-smoking and pet-free. We are happy to rent to students with families. Our apartments are unfurnished and equipped with major kitchen appliances. Basic utilities are included in the rent. There are laundry facilities in the basement of each of our three apartment buildings. Assigned parking is available for tenants and guests. NMC Apartments are conveniently located on Main Campus.